Next week Blackpool and Exeter will play a game of football at Wembley to decide which team gets promoted to the third division. Most Blackpool fans, including myself, will boycott the game. They will boycott because of the actions of the owners, the Oyston family, who have threatened and taken legal action against many of the club’s fans. Football is a sport that entertains billions of people around the world. It helps brings people and communities together. Blackpool FC doesn’t. All of my family boycott the club. It is tainted by the Oystons and their actions. A big game like this would normally be an opportunity for families and the town to unite, whether in victory or defeat. Instead this game will leave the town confused and frustrated, thinking of what could have been. Blackpool’s owners don’t get the damage that they have done to football, the town and the fans. If you are thinking of going to Wembley then, unless you are an Exeter fan, please don’t. While if you happen to be watching or reporting on the game then it’s important that you understand the reasons for the boycott and that you tell others about it. That way you can help support all of the Blackpool fans who are trying to heal the damage of the last few years and create a club that all of the fans can support. It’s hard not to go and watch your team. I remember Brett Ormerod’s goal at the Millenium Stadium when we got promoted in 2001. I watched it with two very quiet friends who were in town to support Preston North End in their playoff final. They were even quieter when Bolton took Preston apart in their game two days later. In 2007 I was at Wembley with my future wife and a group of friends to watch Keigan Parker’s stunning goal help Blackpool beat Yeovil at Wembley to get promoted to the Championship. We met up with a colleague from Yeovil afterwards to share memories and talk about the next season. In 2010, when Brett Ormerod scored the winning goal to take Blackpool up to Premiership, seven of my family were in attendance along with over 36,000 other Blackpool fans. This game will create no such memories or reunions for me or thousands of Blackpool fans. I boycott. That hurts. The Oystons have wasted the opportunity provided by a £90m windfall from Blackpool’s recent season in football’s top division. Much of that windfall has been loaned from the club to other companies. The terrible waste of that money is damaging the club but that is not the main reason I boycott. One 67-year old Blackpool fan had to pay £20,000 for a private Facebook post seen by 34 (yes, you read that right. Thirty. Four) friends. Fans raised the money to pay the fee. My boycott is because the Oyston family have abused fans, taunted them and taken legal action against them. An unknown number of legal actions are ongoing. These legal actions carry a large human cost. Some individuals have lost their jobs, businesses are in jeopardy, relationships with partners have broken down and health has suffered. That damage cannot be undone. The Oystons have to go before many fans go back. The fans are working to get the Oystons out of the club and turn Blackpool FC into something that we can be proud of. A club that puts football first and that all fans can support. While the Oystons remain there is an ethical boycott in place. We call it NAPM: Not A Penny More. The boycott works. The official attendance figures have dropped dramatically and overstate the actual attendance. In some games last year the actual attendance was three thousand lower than the official attendance. The Oystons listen to money. The drop in income will hurt them. The missing fans are still there and still passionate. Six thousand people joined the most recent protest march with Blackpool fans joined by other football fans from around the country. The Blackpool Supporters Trust have offered to buy the club but the owners have refused to enter negotiations. While this happens the local council and its leader have stayed curiously silent and the footballing authorities have sat on their hands, rather than trying to save the club and help the fans. There is an ongoing court battle over ownership of the club but many fan’s only real leverage is to choose to boycott. Our boycotts and protests can help motivate the Oystons to leave and others to act. Some fans will recreate part of the Wembley experience by watching on a giant screen that they have hired. Others will join friends down the pub or stay at home. A few will simply ignore the game altogether, the Oyston’s actions have led to them falling out of love with the club and the game. I know that the short-term pain of missing games is morally right, I cannot give money to a club that sues its fans. I also know that it will help get the Oystons out of the club. The declining revenues, empty seats and protests at Blackpool tell a tale. The tale of a football club whose owners are not wanted and not welcome, who are damaging the game and the town. Eventually they will run out of money or the authorities will intervene. The football league are starting to realise that their rules needs to change so that they can help address the problems at Blackpool and elsewhere. 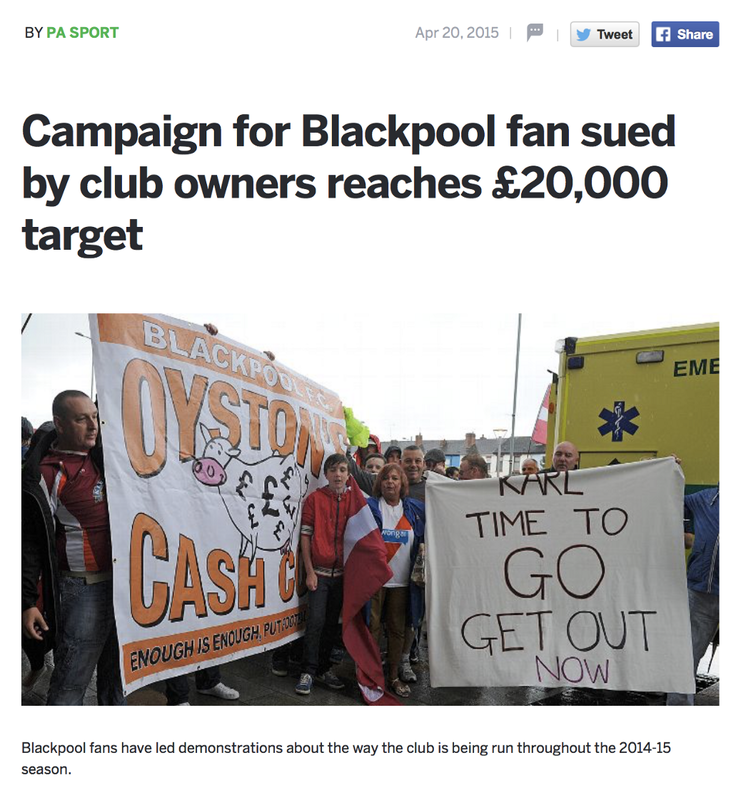 In the meantime the best way to help Blackpool football club is to encourage people to boycott. I hope this post helps persuade some people who might be wavering and helps both journalists and oppositions fans who haven’t heard of our protests understand why Blackpool fans boycott and why that matters. We boycott because of the actions of the Oystons. We boycott to help save the club.